Today we wanted to take the time to share some of the hottest new conference tables on the market. Whether your meeting space is large or small, we have a solution for you! 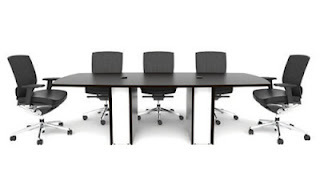 Rest assured, the industry leading conference table solutions found in this post are from the best manufacturers in the business and are guaranteed to impress. Lets start things off with the Mayline TAC8TB Transaction Table. This technologically advanced boardroom table solution is taking meeting areas by storm. The TAC8TB is available in two stunning laminate surface finishes. Transaction table tops are complimented nicely by the modern metal base. Need a different size? No need to worry, Mayline offers a variety of additional Transaction tables to meet your individual spaces requirements. Next on our list is the Cherryman VL-870 Verde Conference Table. This table just screams contemporary style! Right from the get go we know this table offers excellent quality as it's made by Cherryman Industries. The VL-870 is also part of a full service office furniture line which allows for the cohesion of different office areas. It makes a professional statement when businesses choose to outfit there work areas with a matching line of furniture throughout! This stylish table is available in a variety of sizes and with a choice between cherry and espresso finishes. The S1896K4 Lesro Mystic Series Conference Table makes our list at number 3. This new boardroom furniture solution features a unique elliptical work surface with underside shelf. The S1896K4 Mystic table is available in 6 stunning finishes. Mystic tables are also available in round and rectangular versions including a variety of space friendly sizes to meet your needs. Commonly, modern businesses utilize work areas for more than one purpose. Training rooms, boardroom, and educational facilities have come to value modular functionality when shopping for a new conference table. That being said, the Global BXK132S Flip Top Bungee Table Set definitely makes our list. The Bungee line is a unique and versatile collection of tables specifically designed to gain the most out of your multi-use space. The BXK132S set includes a grouping of mobile flip top tables that configure to form a boat shaped conference table and a variety of popular training room furniture configurations. Bungee tables are available in 12 high end laminate finishes with a choice of configuration size and base finish. These tables really have it all! Last but not least the Mayline BT31 Brighton conference room furniture set definitely deserves it's spot on our list. Where else can you find everything you need to build a professional conference room all in one package? The BT31 truly simplifies the conference room shopping experience! This unique set from Mayline features an 8' conference table, two 5-Shelf Bookcases, storage cabinet, glass display cabinet, low wall cabinet, and visual presentation board all for under $2200.00. Now that's a deal! 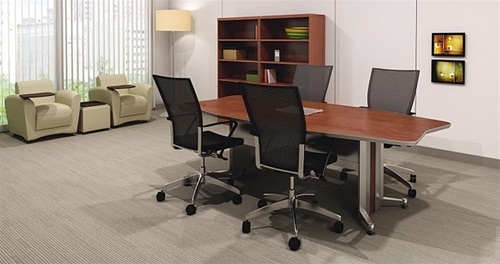 Brighton conference room office furniture is available in a choice of cherry and mocha laminates. This line of Mayline furniture is without a doubt the most affordable line of professional boardroom furniture on the market.